Register Log In ECN Forum Forums Violation Photo Forum Whats Wrong with this Picture? Adding Diesel and Kerosene tanks and related equipment to an already existing gas station. Open up the sub panel to see whats up and imagine my surprise. Look closely at the "base" of the breakers in question...I see a neutral wire coming into each one. (Top one has curly pigtail, second one a well-weathered [or cooked?] noodle) Since there are no visible test buttons, I would guess that these are breakers designed to interrupt the grounded conductors when tripped. Isn't that required on fuel dispensing equipment? When I opened the panel, I was trying to find out what leg the pump electronics were on so I could phase the new pumps on that same leg. Couldn't understand why I got 120 or 208 no matter where I placed the breaker until I really looked and saw neutral on hot side of the 2 pole switched neutral breaker. Most of have been a friday afternoon job he had phased the stuff right but just placed wires wrong. Someone with more Electronics knowledge than me explain how this would affect(hot and noodle reversed) power supply in pump??. Anyone like my lock out tag out yellow tape . These wouldn't be for "white gas" dispensing pumps...? Seriously, though, this is a NIGHTMARE! Another death waiting to happen :anger:!!! Switched neutral breaker, not sure if they are required, but should not be reversed. Not sure what damage it could cause, but still not cool. Hmmm... if that IS a switched neutral and required for such a hazardous (classified) location then that red on my face isn't sunburn. Otherwise- grrr!!! It could be (although I'm not exactly certain from the photo) that the neutral breakers could be part of the emergency shut-off switch circuit that is required in NEC 514.11. Here is the potentially applicable section in the 2002 handbook. (A) General. Each circuit leading to or through dispensing equipment, including equipment for remote pumping systems, shall be provided with a clearly identified and readily accessible switch or other acceptable means, located remote from the dispensing devices, to disconnect simultaneously from the source of supply, all conductors of the circuits, including the grounded conductor, if any. Handbook Note: Single-pole breakers utilizing handle ties shall not be permitted. The disconnecting means required by 514.11(A) must be clearly marked and readily accessible. The disconnecting means also must be remote from the dispensing device, so that if an emergency occurs that requires rapid shutdown of the dispensing equipment, the person operating the disconnecting means will not be exposed to the hazard. It is important to note that all conductors of a circuit, including the grounded conductor, that may be present within a dispensing device must be provided with a switch or special-type circuit breaker that simultaneously disconnects all conductors. 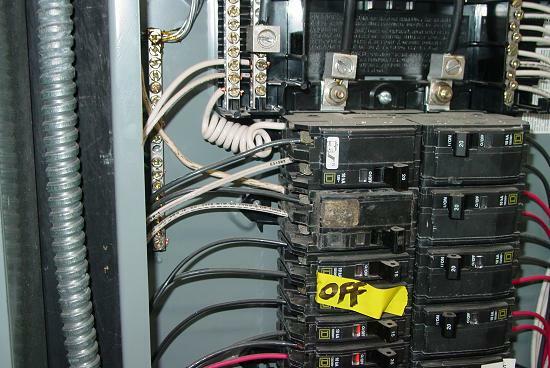 Handle ties on single-pole circuit breakers are not permitted. The intent is that no energized conductors are in the dispenser vicinity during maintenance or alteration. Considering possible accidental reversal of the polarities of conductors at panelboards, the grounded conductor must be able to be switched to the open or off position. Grounded conductors may be present in old-style pump motors, or they may pass through a dispenser as part of a circuit for the dispensing island lighting. 514.13 Provisions for Maintenance and Service of Dispensing Equipment. Each dispensing device shall be provided with a means to remove all external voltage sources, including feedback, during periods of maintenance and service of the dispensing equipment. The location of this means shall be permitted to be other than inside or adjacent to the dispensing device. Handbook Note: This requirement is intended to enhance the level of safety for personnel servicing dispensing equipment. As more sophisticated control circuitry is integrated into dispensing equipment, simply shutting off the main power source to the dispenser or remote pump does not necessarily ensure that the equipment being worked on has been isolated from all sources of voltage. To ensure that the equipment is completely isolated from all voltage sources, a means must be provided to remove all external voltage sources from each dispensing device, including sources that may backfeed into the dispenser. You can also check out the requirements in NFPA 30A, which (at least for the time being) is available as a "read-only" free document on the NFPA website. Although, it pretty much says to install according to the NEC. Not a shunt trip, is it?